Scheduling the tasks you want to run at each location. pSConfig assists with these challenges by providing tools to automate each of the configuration tasks listed above. It is helpful to understand a few basic terms when discussing pSConfig. Starting at the most fundamental level, a task in the context of pSConfig is a job to do consisting of a test to be carried out, scheduling information and other options. In fact, a task in pSConfig means the same thing as a task in pScheduler. Beyond individual tasks, pSConfig is also concerned with how the tasks are interrelated and arranged, known as the task topology. Many tasks have common parameters or are related in some way, so it’s important to be able to look at the tasks as more than just a set of independent jobs. pSConfig cares about these relationships so it can be used as input to visualization components such as MaDDash to relate the results in meaningful ways. A pSConfig template is a description of the task topology in a machine readable format. pSConfig templates are expressed in JSON files. The templates are designed to be highly expressive and extensible so that new capabilities can easily be supported. pSConfig templates by themselves are just files, and they only become useful when something reads them and is able to perform action based on their content. With the fundamentals out of the way, we can now bring them together to demonstrate the basic workflow of how pSConfig can be used to configure a perfSONAR deployment. Step 3 involves configuring agents to read your published templates. 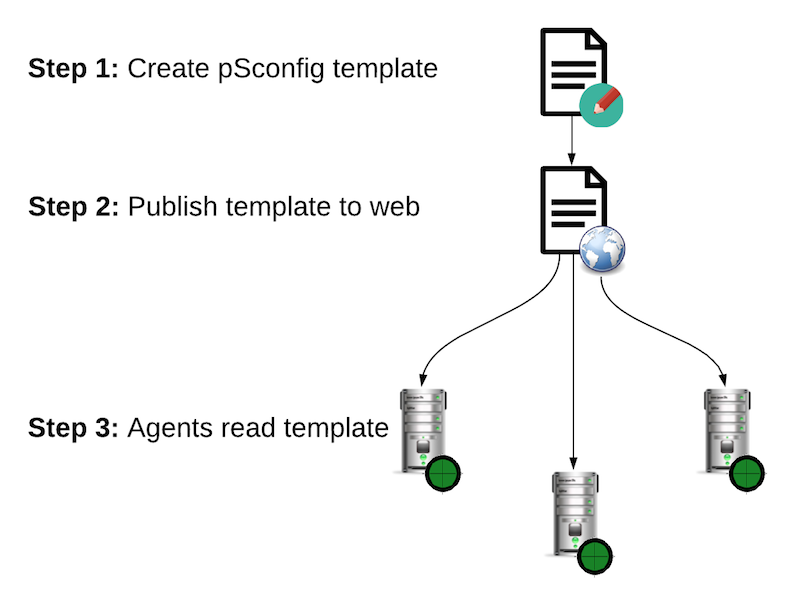 perfSONAR currently provides two agents: information on the pScheduler agent used to create tasks can be found in Running the pSConfig pScheduler Agent and information on using the MaDDash agent to configure dashboards can be found in Running the pSConfig MaDDash Agent.